This weekend I just went to a great art show in Toronto, at a pub called Wilson 96. 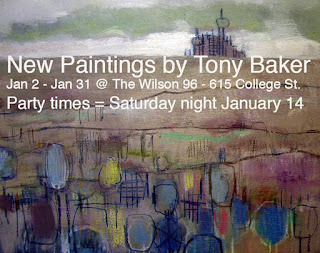 My friend Tony Baker was showing a series of paintings that make me wanna switch careers. I am not going to pretend like I am a fancy pants art critic, because I am not but I will tell you a bit about these paintings. Tony has created this crazy alternate world in which his paintings are set - the world is filled with robots, factories, massive towns, burning buildings, all squished together in landscapes that have the end result of being both tinged with a bit of humour and sadness. It feels as though you are looking through the eyes of an innocent in the paintings, they have a childlike zeal both in application and in spirit. I really enjoyed the show and would recommend anyone in town to check it out until the end of January. Here is Tony's website should people who can't get to Toronto, want to check him out on their own. I just bought one of his works, a small one, I have always loved how his scenes are both child like and dystopian. Embroidered me some bones... yes I did. Namesake Hooplas - French Knot Mania!